☑ Perfect Materials -- Genuine Cowhide, skin-friendly and comfortable. ☑ Better Closure -- superior 316L stainless steel buckle, longer lifetime. ☑ Bracelet length -- Fit small & large wrists from 5.5"- 8.1"; Width: Slim. ☑ Easy Installation -- Simple and direct installation, one button removal. ☑ Durable&sturdy -- Metal Clasps fit seamlessly onto your charge 2 watch interface ensure the stability and security. 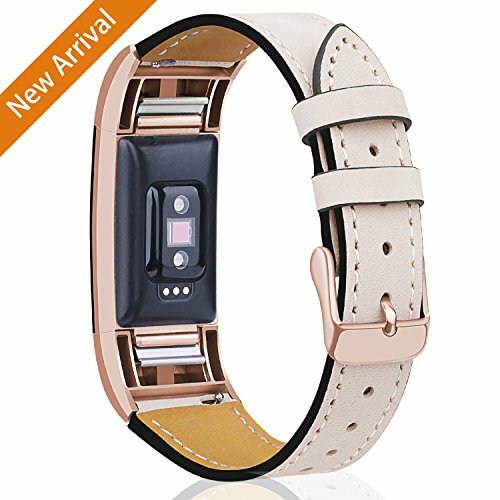 ☑ Fashionable Look -- Classic and fashionable leather band not only highlights your unique taste, but also fits your daily outfits. ☛The leather band/screen protector is specifically designed for Fitbit Charge 2 ONLY.Tracker is not included. 1.Not intended to be worn during high intensity workouts or during sleep, which could affect the overall appearance and quality of the accessory. 2.Direct sunlight, high temperatures and humid conditions can cause discoloration or damage over time. 3.To minimize damage to these bands, limit exposure to moisture and substances. 4.Leather bands aren't sweat or water resistant. Soaking them might cause damage. ▶30-day money back guaranteed.180 days quality guarantee. ▶Please feel free to contact us if you meet any question BEFORE you review it. We will try our best to solve your problem. ▶Top Material: Made from 100% genuine calf leather strap, Anti-slip and sweat absorbent, soft slim and lightweight design in rich colors while provides comfortable and smooth touch feeling on your wrist, makes your tracker more exquisite and shows your unique taste in the meanwhile. ▶Wrist Size: 5.5" -8.1" cover official size, one size designed for most people, no matter men, women, teenagers, or the aged in most occasions. Precise multiple alternative holes allow you adjust the suitable size, giving your wrist a comfortable touch feeling. ▶Note: Mornex Replacement Strap Bands for Fitbit Charge 2 ONLY (NO Tracker).When you shower or swimming,please DO NOT wear this band for longtime underwater. Fitbit charge 2 fitness wristband suits for different occasion, looks good no matter what you are wearing. ▶180 days Guarantee: Mornex providing you a wonderful shopping experience. If you have any question, please contact us without hesitation,we will offer unconditional replacement or refund. Search "Mornex fitbit charge 2 bands" for other accessories offered by Tech Vendor. If you have any questions about this product by Mornex, contact us by completing and submitting the form below. If you are looking for a specif part number, please include it with your message.